Fail2ban is a log processor that uses regular expression (regex) filters to scan log files and perform custom actions once the expressions find matches. For each log file (or set of corresponding log files) fail2ban sets up a jail. Matches that meet the criteria set by you within the module configuration are stopped by the jails. What does all that mean to you? Well in other words, once an offender tries to access your FTP server and fails to give correct username and/or password after 3 attempts, they are put into a jail (where they belong!) corresponding to the action triggered by their failure. 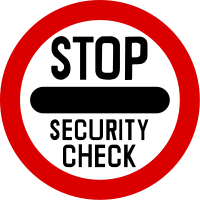 Fail2ban uses a set of filters that match against your logfiles in search of specified patterns (regular expressions) used to detect break-in attempts, password failures, etc. Once fail2ban finds a match within a log file, it will perform the action defined for that filter. You can create your own filters or modify the existing ones to meet your needs. Filters are managed from the Jail tab area. Just click Manage Filters as shown below. You can create your own filter by clicking the Add filter icon on the blue stripe. Plesk will redirect you to an empty editor where you can enter your regex search pattern. Just specify a name for the filter and the content (the filter rule). After you’re done, just hit OK and your new filter will be added to the list. Actions can be modified as they’re added to the jail rule. You can add any action you want, or modify defaults. The particular components of the action are passed through the jail to a firewall service that blocks an IP within the jail’s created chain. Plesk lets you modify the action rules, and I recommend to at least change the name and port from the default for any custom actions (modified or new) to make them easily identifiable. 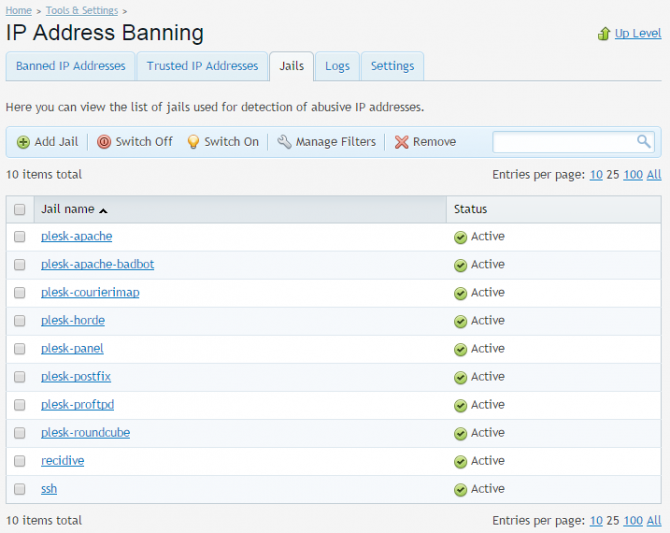 Below this, you should see the default Plesk fail2ban Jails, together with any custom jails that you create. If you want to make changes to a jail, simply click on its name. 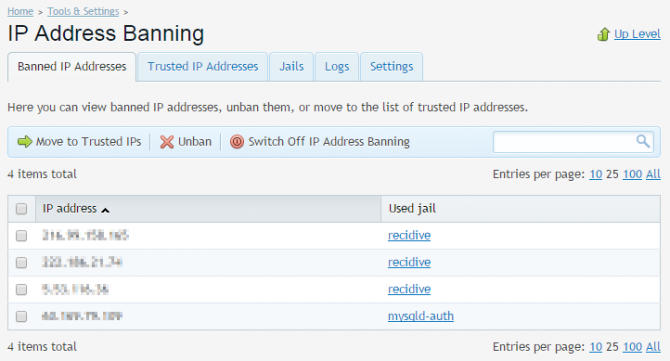 You will be redirected to jail administration screen detailing its current settings as well as a list of IP addresses currently jailed (banned) by it. From this level you can edit the jail actions and filter it uses, as well as specify logpath to be scanned, maximum failure attempts for a single IP and ban time. Once a jail is created or edited, fail2ban will reload the set of jails to make sure any changes won’t go unnoticed. As this is a new feature, we don’t currently enable it by default – but don’t worry, Fail2ban Plesk module configuration is fairly easy. To enable fail2ban module, enter the module configuration area and tick ‘Enable intrusion detection‘ under the ‘Settings‘ tab. IP address ban period – the default time for which an IP should be banned, unless configured otherwise within a jail settings. Making this value bigger will block more aggressive attacks. A good value would be 86400 seconds (1 day). A value of -1 means a permanent ban, however this should not usually be used as a default since many end user IP addresses are dynamically assigned. Time interval for detection of subsequent attacks – the time window for detecting number of failures. Number of failures – the number of failed attempts (within the detection time interval) before an IP gets banned from the system. After enabling fail2ban module, you can proceed to configuring particular areas of fail2ban operation. 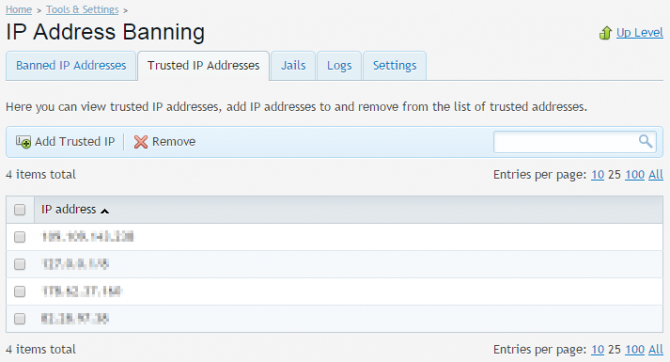 You can choose which jails you want to enable, specify trusted IPs (helpful if for some reason your personal IPs are getting blocked), review a list of banned addresses, create your own filters and actions. 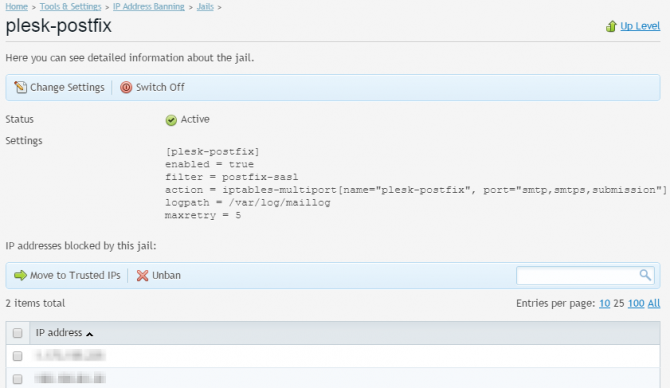 By default, fail2ban ships with several Plesk oriented jails, such as SSH, FTP, Plesk Panel, mail authentication jails. It will only block intruders using iptables, and log the banned IP within the module administration area. This action can be useful if you are not sure if the IP should be trusted or not. Next time the IP triggers any fail2ban jails, it will return to the banned list. 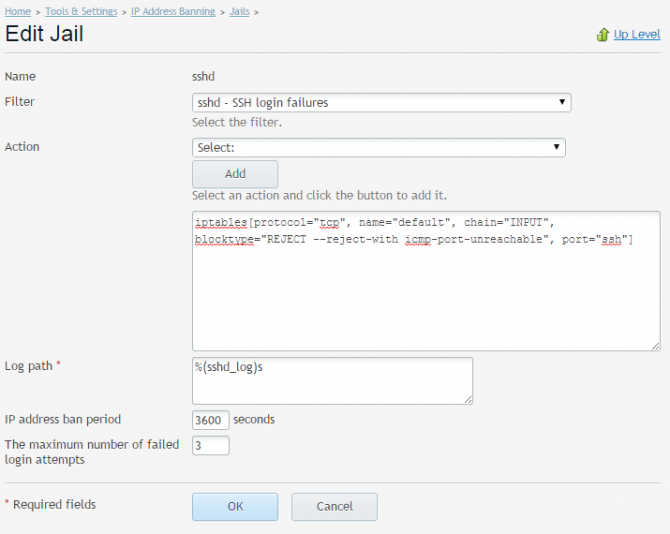 You can manually specify IPs, network ranges or hostnames that should be whitelisted by fail2ban. It is a good idea to add your own or your clients’ IP addresses here so you won’t ever lose access to Plesk. You can also add your own jails, specify ban rules and actions depending on your needs. If you’re a Layershift customer and unsure on how to handle custom rules, or need more information on fail2ban, simply contact our support team and we will be happy to assist. And of course if for some reason you’re not already enjoying stress-free fully managed servers from Layershift, now is the perfect time to join us – we offer free professional migration too.